The UK recorded a 34.8% uplift in electric and hybrid vehicle registrations during 2017, despite overall volumes falling 5.7% to 2.54m units, according to the latest Society of Motor Manufacturers and Traders (SMMT) data. 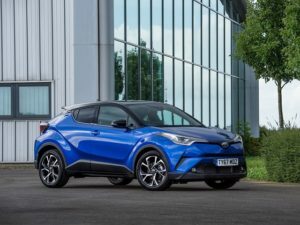 Toyota’s C-HR accounted for almost a fifth of the UK’s hybrid market last year. A total of 119,821 alternative fuel vehicles were registered in the UK last year, compared to 88,881 in 2016, with the sector now accounting for one in every 21 new cars. That growth is led by hybrids which, excluding plug-in models, accounted for 72,523 units or 60.5% of the total alternative fuel vehicle market, up 40.0% on the 51,778 registered in 2016. Most of that hybrid volume comes from Toyota and Lexus. The two brands held a combined 80.4% share of the UK’s hybrid market during 2017 – 58,323 units, of which 45,803 are Toyotas. The Yaris (12,553 units), C-HR (10,760 units) and Auris Hybrid (10,728 units) were its biggest-selling hybrid products last year, while 98.8% of Lexus UK sales have a hybrid drivetrain. Electric vehicles (including hydrogen fuel cell vehicles) climbed 32.5% year on year, to 13,597 units, though most plug-in models registered in 2017 also have a combustion engine. Plug-in hybrid and range-extended vehicles totalled 33,666 registrations, up 25.5% on 2016. Of those, 93.8% were eligible for the Plug-in Car Grant, which has a price and CO2 cap excluding some vehicles. That compares to 94.6% eligible vehicles during 2016. The SMMT said market decline had been partly due to “anti-diesel rhetoric and the potential for tax hikes” – diesel registrations were down for the ninth consecutive month in December, to a 17.1% year-on-year decline. Petrol volumes climbed 2.7% during 2017, contributing to average CO2 figures rising for the first time in two decades, to 121.04g/km compared to 120.11g/km the previous year. However, tightening NOx emission limits and ‘NEDC correlated’ figures produced while re-testing for the new WLTP economy cycle (which came into force last September) is likely to have played a part too.